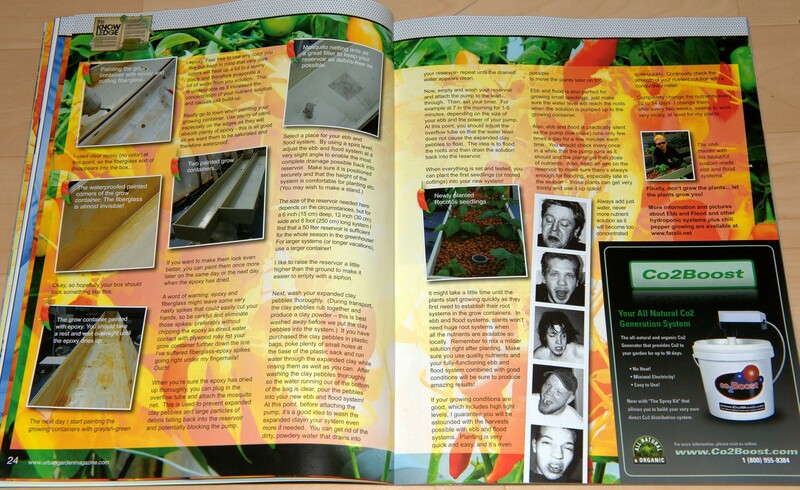 Fatalii's Growing Guide - Growing chiles with hydroponics! 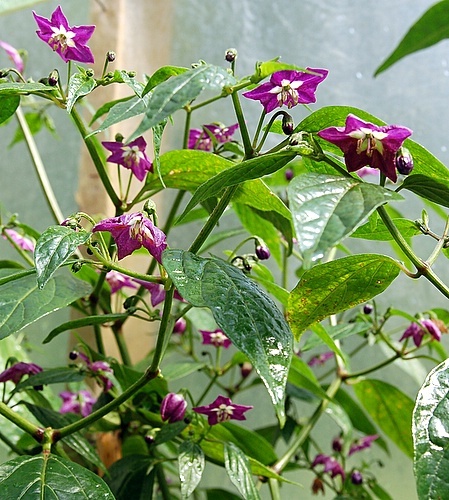 The fastest, easiest and most producive way of growing chiles! It also gives you the best tasting results. 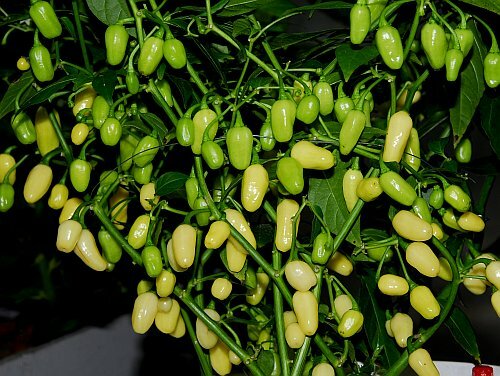 Dutch-Habanero growing on hydroponic system! 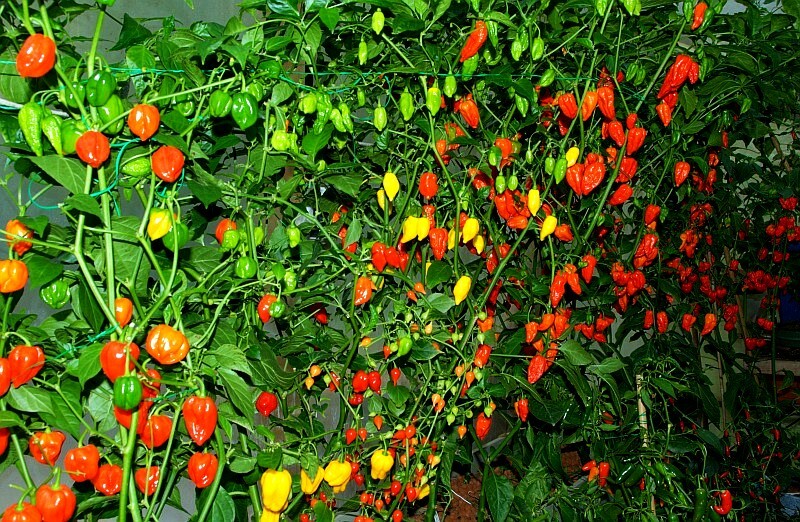 - possible to grow varieties which would be impossible to grow in time in cold climates! 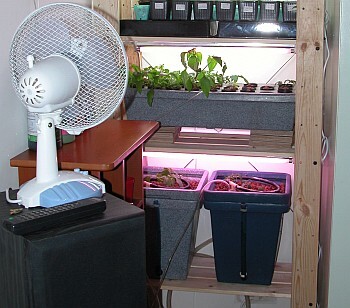 Hydroponic system with air pump. Works well for small seedlings. For larger plants, use water pump or other system, like EBB & flood! 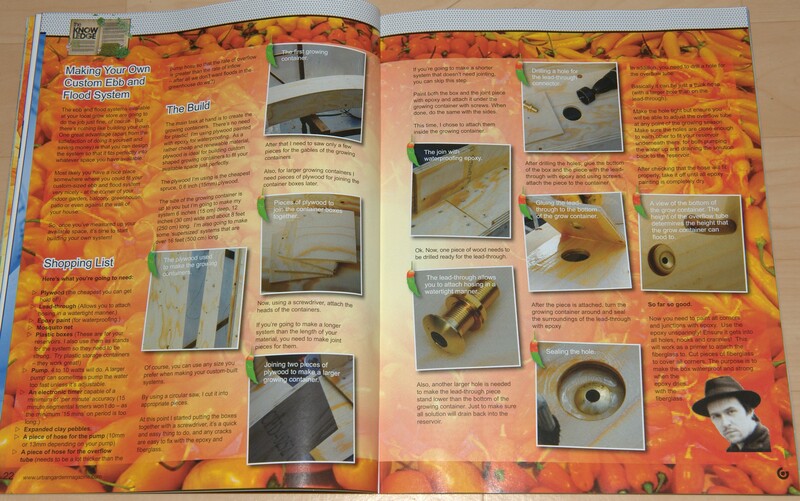 Short introduction to hydroponic growing mediums & pots. People often ask: "How can they grow in such a small pots?". 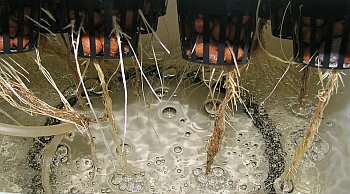 The idea of the pots and growing mediums used with hydroponics is to keep the plants steady, plant roots aren't restricted to those small pots that help to keep the plants up, instead, the roots are growing in a containers separately or with the nutrient solution, depending on the hydroponic system you're using. 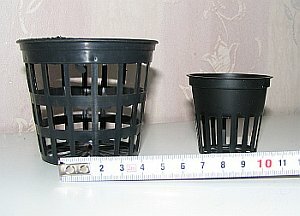 Large and small hydroponic pots. Small, medium and large rockwool cube. 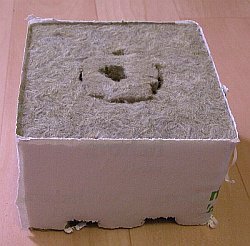 I use rockwool mostly for germinating and growing small seedlings, the smallest cube can be inserted inside the big cube, this is very handy way of transferring the plants into bigger hydroponic systems! Small rockwool cube inside the large cube. 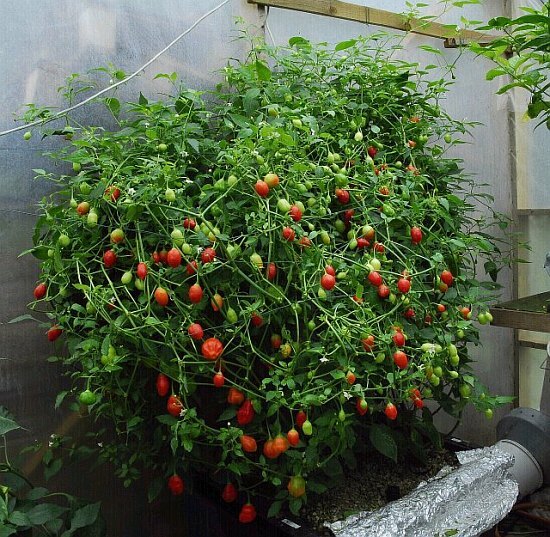 Depending on your hydroponic system, rockwool cubes can be used as the only growing medium all season long. 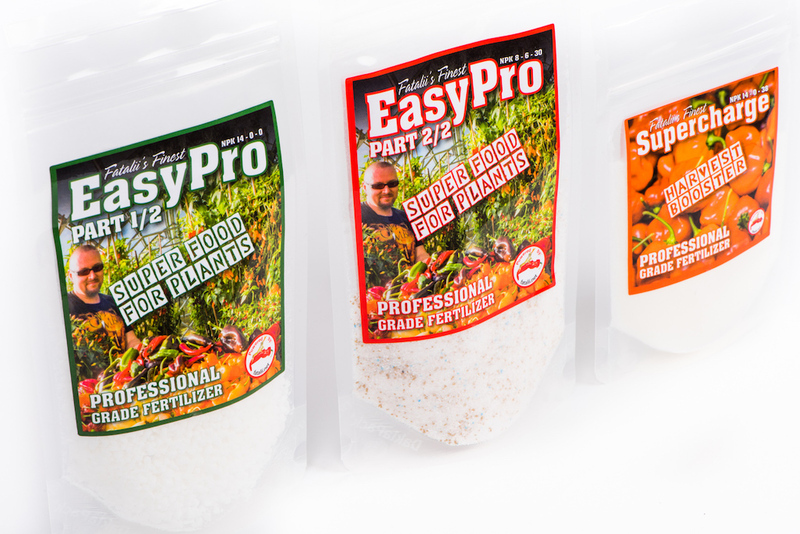 Expanded clay is a great choice to be used as a hydroponic growing medium because after washing it properly, it can be used over and over again! 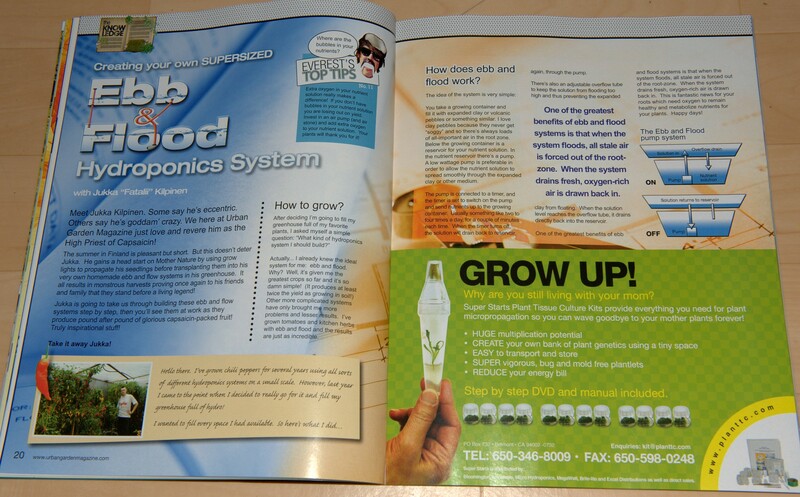 A good choice for many hydroponic systems. Make sure you wash the clay properly before the first use. 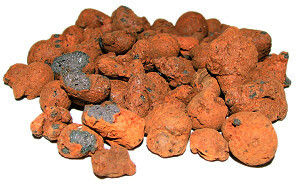 Here's a professional quality, yet easy to use fertilizer which gives you the best results. These are suitable for all mediums, both soil and hydro and work great with any hydro system. 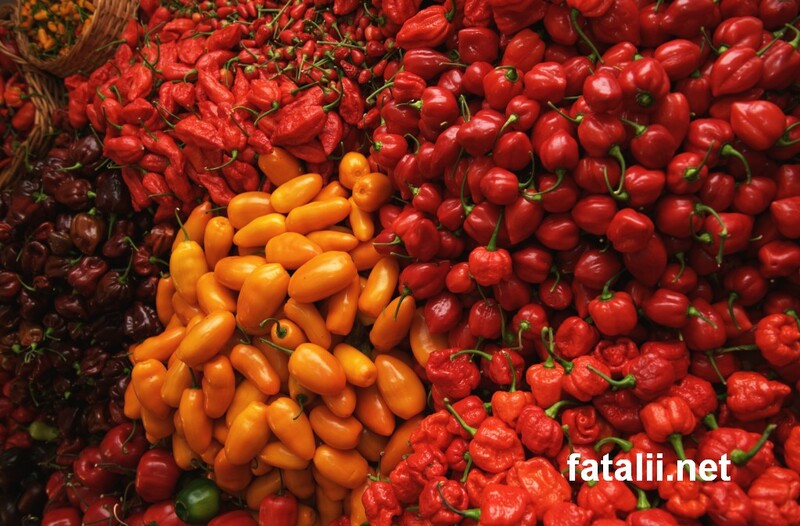 If you've grown chiles before, it's recommended to choose varieties you really like. I use smaller bags of soil to learn about new varieties, the ones I like the most will be grown hydroponically next time. 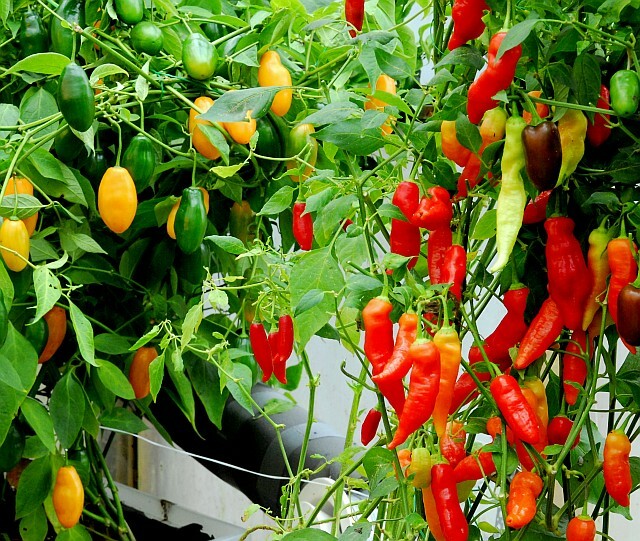 different varieties in hydroponic system with many plants too see which ones you like. Different varieties in a growing in hydroponic system. Or, it might be wise to ask other chile-heads opinions which varieties they think are worth growing in hydroponic systems! In other words, hydroponic systems are too good to be wasted for varieties that you don't like too much. Due to the fast growing rate achieved with hydroponic growing, it's possible to start the season much later with hydroponics than with traditional growing methods, but still, it's always better to start early. It's also possible to grow long season plants much faster, which is a very good thing if you live in a place with a short growing season like I do. Here's an article that covers all about germinating with the method that has worked for nearly two thousand of different varieties and several thousands of seedlings! Now, it's time to apply the solution (you can do it in the germinating box too if you like, with a solution that is diluted very much). Read the instructions from the nutrient bottles of your choice. 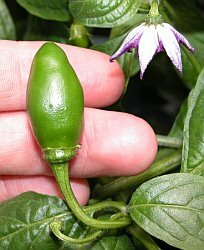 I've learned that different chile varieties like it when the solution is quite mild, just read the instructions and dilute the solution even more than is recommended by the manufacturer. 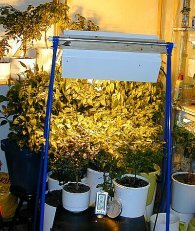 When using artificial light, you should experiment with milder solutions first and that way you can learn which solution is the best for the varieties you are growing in the circumstances you've provided for them. Mixed solution in hydroponic system. After mixing the solution, you should check the pH. 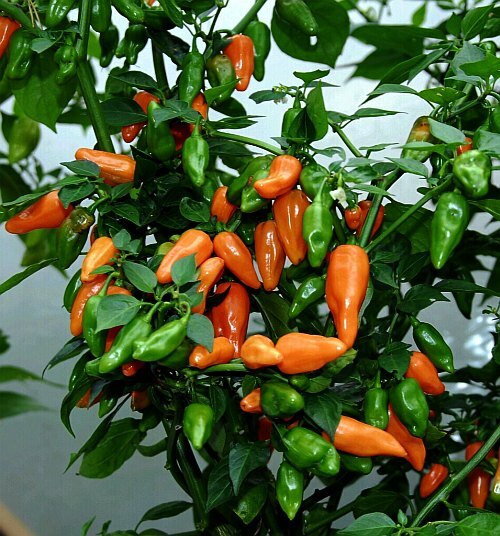 Chiles seem to grow best when the pH level is around 6.
hint how acidic your water is. Checking is very easy, just follow the instructions of your testing equipment. 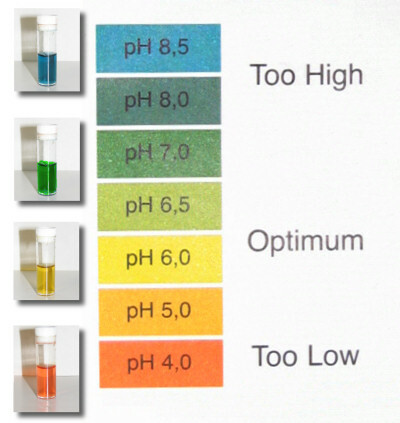 If your water has too high or low pH-level, you should use pH adjusting liquid or powder to adjust it. Or if your water has too high pH, you can use it to raise the pH of your solution, for example if you accidentally lower it too much. After measuring and correcting the solution with pH-adjusting liquid you should let the solution mix well overnight and check it next day and correct the pH if it's still wrong. the pH few times you'll be able to do it very quickly and you don't have to do many re-checks. After experimenting with it a while, you'll learn to see if the pH level is correct by just looking at your plants. of course this needs lot of light and proper air circulation too! quickly when the pH-level is corrected again. Dutch-Habanero with a wrong pH-value. Same thing goes with the bad solution (bad ratio or too strong or mild solution). 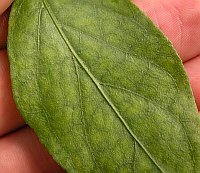 In hydroponic systems correcting problems like this is very easy, unlike in soil, just change the solution and re-check pH and we're done! until it's time to change it all. 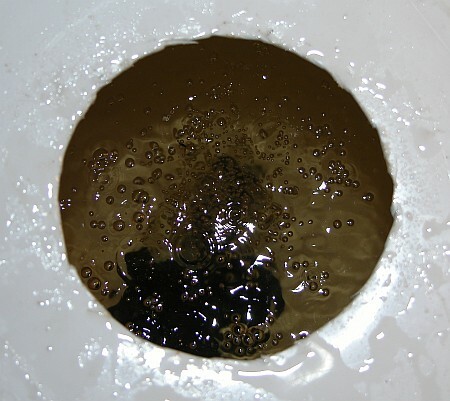 In other words, after two weeks, empty the reservoir completely and mix the nutrients. If the solution rans out, just apply water and adjust the pH of the solution if needed. 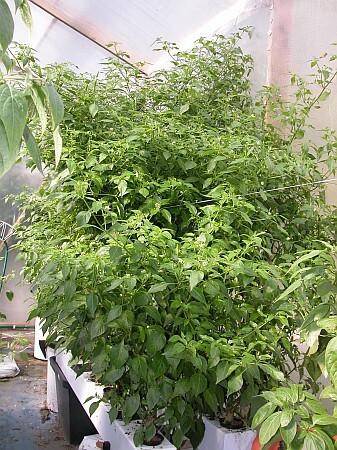 When the plant's have grown bigger, you can try solutions with more or nutrients in them. At each next solution change you can decide if it was a good or bad idea to increase the amount of nutrients. Usually, beginners like to thing "more is better". 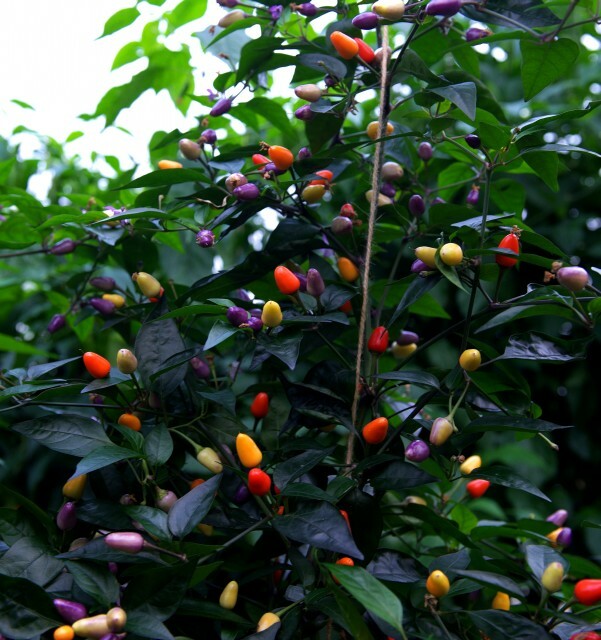 which leads to over-fertilizing which will either slow down the growth or give poor yields. Experiment and learn, it's easier than you might think at first. At the early growing stage, you can use much more nitrogen to boost the growth. With hydroponics, over-fertilizing isn't a problem as you can change the solution whenever you want! 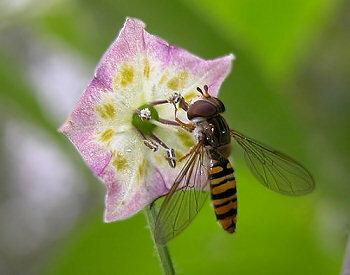 Even so, too strong solution will not mean that the plants will grow more efficiently! 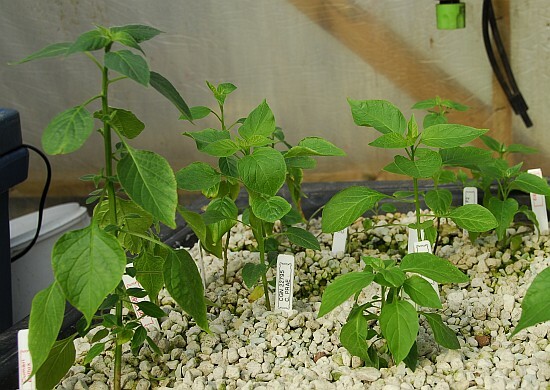 Over-fertilized plants get stunted very easily, or in worst case, they will die, so be reasonable when experimenting with different nutrient ratios. At first it's a good idea to experiment with more diluted nutrient solutions to learn the difference. In other words, read the manufacturers recommendations from the nutrient bottles, and dilute the solution even more. Some varieties might grow faster with stronger solutions, like C. baccatum group in common. At this point it's good to use cool spectral color fluorescent tubes (or fluorescent bulbs). It's possible to use only sunlight when there's plenty available, in some places however, extra light is needed for proper growth. 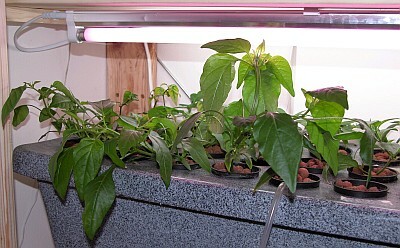 When moving the plants closer to fluorescent tubes or bulbs, I add a fan to cool the tubes off and strenghten the young seedlings. indoors where the air won't usually circulate effectively, unless you have a very effective air-conditioning, but I'd still use the fan too. 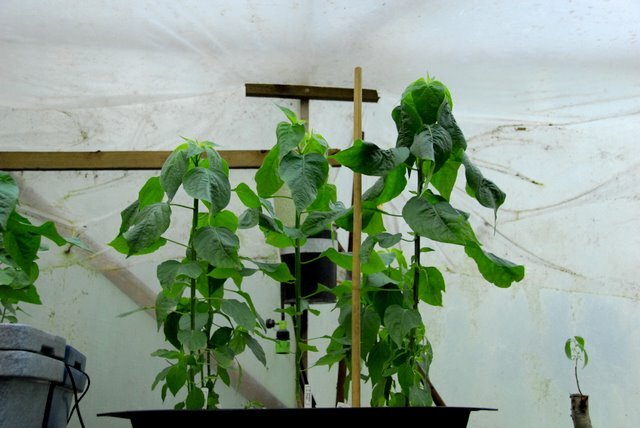 Fan makes the bigger plants stronger too, so they won't break too easily and they can bear much more pods! Very important especially for indoor growers! Highly recommended for greenhouse-growing too. If you're growing plants temporarily on multi-plant hydro system, replant the seedlings when they're big enough to be moved outdoors, onto the balcony or into the greenhouse. You can replant them in soil, to their final pots, or preferably, transplant them into bigger hydroponic systems, like EBB & flood. Seedlings growing on EBB & flood hydroponic system. 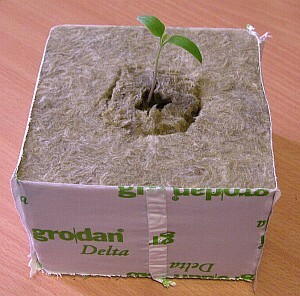 If you're using just rockwool cubes and germinating box for growing the early seedlings, and you need larger rocwool cubes depending on your growing system, insert the small rockwool cubes inside the large rockwool cube and plant it as shown below. If you're a serious chile-head, you might have a bigger system. where you can grow plants from beginning to end and achieve maximum yields! 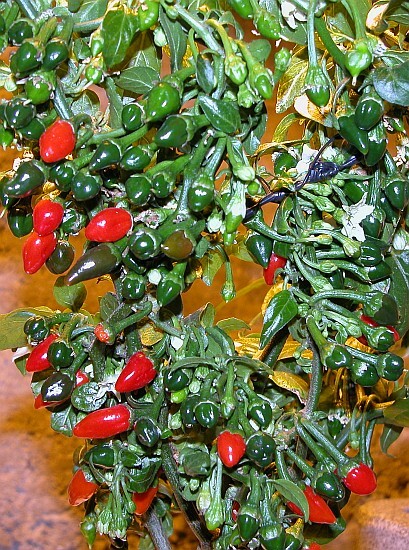 Hottest chiles in the world growing on EBB & flood system. When the main part of the growing will be done outdoors or in a greenhouse, it's often necessary to harden-off the seedlings to withstand the strong sun and extreme weather conditions once outside. The best time to start hardening-off is during cloudy weather. At first, it's a good idea to keep the plants out just for short periods of time, and away from the direct sunlight. Leave the plants out for for a little longer each day. 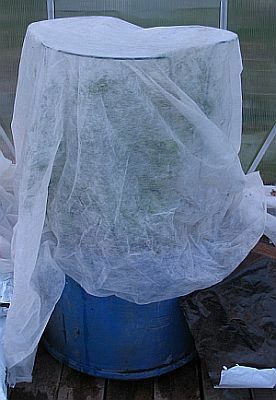 Also with hydroponics, I have had a great success using lace-cloths with the hardening-off process. There are big differences between different varieties with hardening-off so it's impossible to tell how long it'll take, but usually it varies somewhere between 2-6 weeks. Same thing with amounts of lace-cloth, for some varieties, one layer is enough, and some fragile ones like 3 layers depending upon the material of the lace-cloth used. That's why using lace-cloth during hardening-off is something that I really recommend. For some varieties, it's good to leave one layer of lace-cloth for a long time, sometimes for the whole season -> they will still get enough light, it's just shaded partially and that's the way some varieties like it the most, for example many varieties from the C. chinense -species. When hardened-off properly, the hydroponic plants will respond with an incredible growth rate! With faster growing varieties you won't believe your eyes when the season progresses! 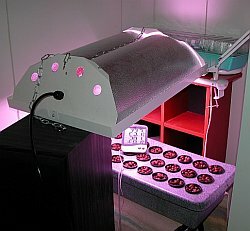 If you're growing indoors or want to provide longer days in the greenhouse, use a warm spectral color lamp like fluorescent bulbs or tubes with yellow, red or purple color, or a high pressure sodium vapor lamp (600 watt HPS gives you the best efficiency, if you're using just one or two lamps). An especially good choice when the season is running short in autumn. 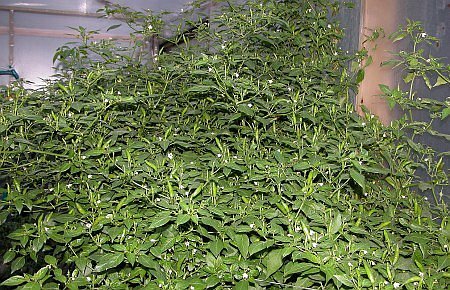 HPS also works well as a transitional stage before the outdoor hardening-off stage, it helps in shortening the time taken by the plants to adjust. If you have very sunny windowsill, it might work just fine. With hydroponic growing, you can adjust the nutrient ratio in such a way to make the plants drop off the early flowers by themselves. Some flowers might still stay on the plant, just pinch them off until the plant gets big enough to produce satisfying yield. This is recommended method especially when grown indoors. Remember: the growth will still continue even when the plant is flowering, even if the growth is not as effective as before. When the plant looks big enough to start producing, make sure the plant has lot of light available. At flowering and early fruiting stage, the intensity of the light is much more important than in the growing stage. 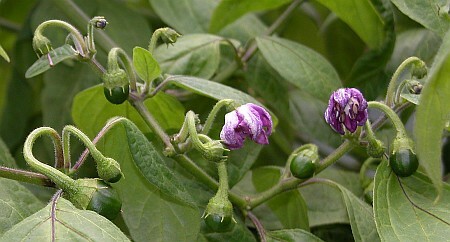 Locato (C. pubescens) flowering after TopMax dose. solution has too much nitrogen in it, Try changing the solution or adding some water. 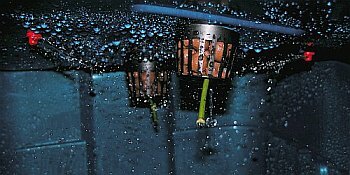 too high or low temperature causes flower drop, especially night temperatures are crucial, correct the temperature problem if possible. Acceptable temperature range is around 10 (night) - 30 (day) degrees celcius. C04896 (C. pubescens) growing on hydroponic system. the space for roots, generally speaking, you won't need nearly as much space for roots with hydroponics as with soil-based growing. Grif 9345 (C. pubescens) growing on Hydroponic system. When the pods are almost mature (maximum size), you should start decreasing the nitrogen from the solution. When the maturing is very close, you should remove the solution and use only water, this makes the pods taste much better. 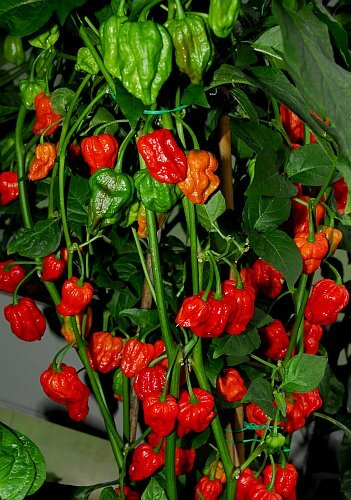 This is ideal if you want to have fresh pods available as regularly as possible, it's not as ideal if you want to have beautiful plants with lots of pods on them once. 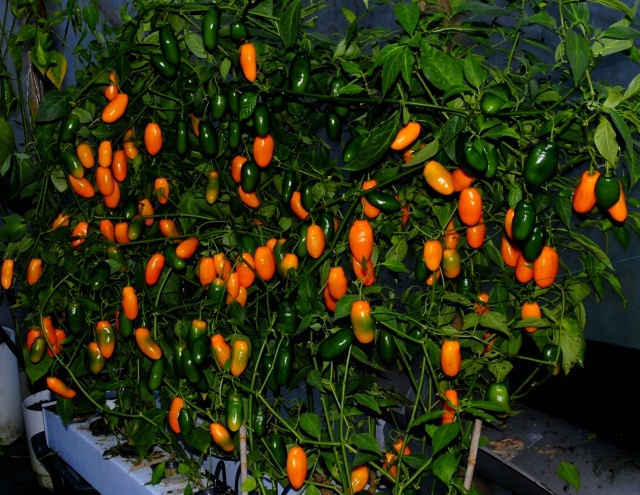 Some varieties become stimulated and start producing pods even more rapidly! 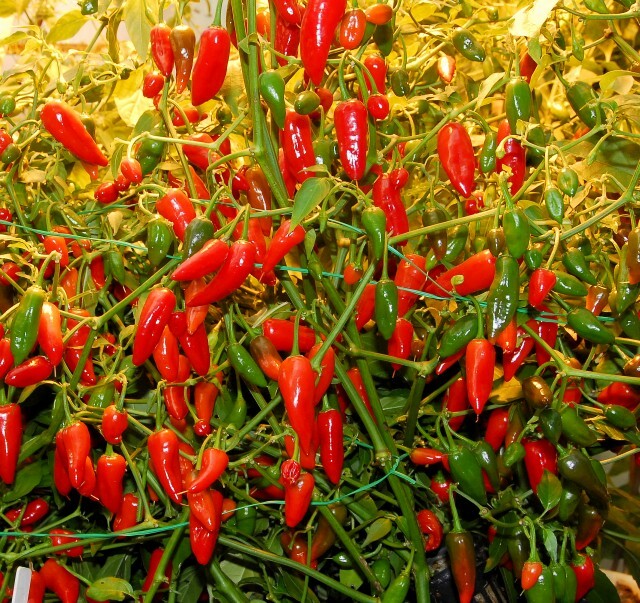 When chiles are treated well, they will reward a long season's toil very generously. Don't just grow the plants, let the plants grow you! 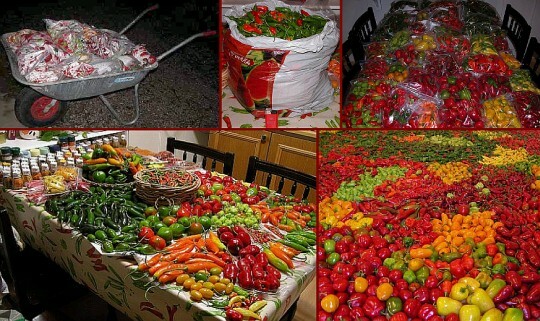 Brought you by a professional chile pepper grower / breeder!